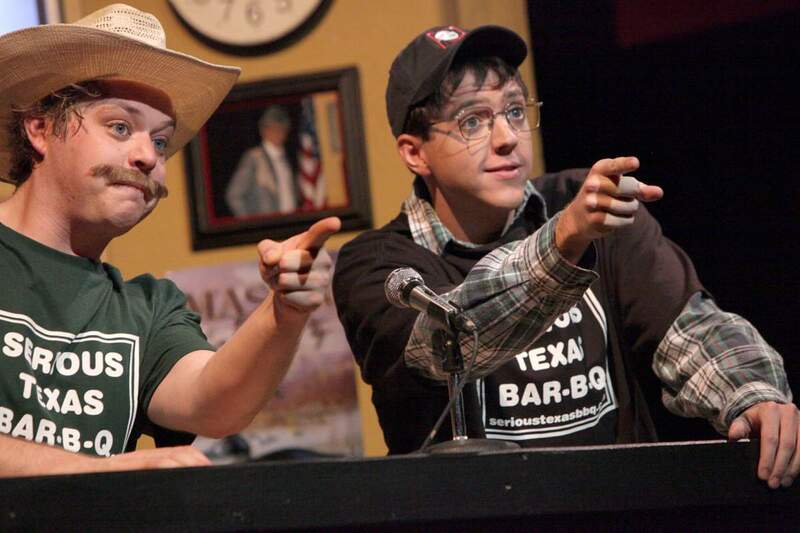 Geoff Johnson, right, and Miles Batchelder took on many roles for the summer 2011 production of Greater Tuna at the Durango Arts Center. Johnson will share his talent for comedic versatility with would-be actors at a Nov. 3 improvisational comedy workshop at the DAC. The great playwright Anton Chekhov once said that an actors imagination is rich and revealing for the audience as well as for the actor himself. Its a puzzling contradiction  the creative, revealing nature of theater is what lures so many to the stage and simultaneously keeps so many from it. Now, the Durango Arts Center is indulging that unrequited desire with a new series of one-day adult theater workshops, offering a taste of acting, playwriting, song and dance, and even Shakespeare. As adults, we have these secret passions or things that weve always wanted to do and for some reason havent, Theresa Carson said. Carson, who recently joined the Durango Arts Center as artistic director and theater manager, designed the three-hour long workshops to be an easy and safe introduction to the theater. The classes have attracted new and experienced students. I (wanted) to try something different that Ive never done before  put myself in a new situation that was comfortable and safe, said John Vroman, a first-time acting student. Vroman was joined by Wendy Ludgewait, a veteran of the Durango stage, in Mona Wood-Pattersons Acting: Making the Scene Come Alive on Oct. 6. Theres always room for improvement, Ludgewait said. The workshops  to be held every Saturday through Nov. 10  feature professional instructors from the Four Corners. This weekend, Suzy DiSanto of Durango Dance will lead Dancing Through Broadway, an introduction to the timeless dance sequences of the last century. Just because were living in a small town doesnt mean we dont have a ton of amazing, talented people here, Carson said of the instructors. Remember Whose Line is it Anyway? The popular ABC show with Drew Carey brought the mad-hat art of improvisation to televisions across America. A classic acting exercise, improv places actors in situations without a script and asks them to find a solution, often to hilarious ends. It is not only an entertaining aspect of theater, but also a useful tool for actors of all skill levels. The final workshop will be playwriting with Dinah Swan. Swan has won numerous national awards for the craft. She taught play and screenwriting for 26 years. Her workshop will be an introduction to the elements of drama and help writers develop their own scripts. Carson hopes the workshops will not only serve as a creative outlet for Durangoans, but also raise awareness about DACs theater program. Whether through creating new actors, playwrights and crew or developing new audience members, the workshops are a much-needed addition to the centers educational offerings. For registration information, call Theresa at 259-2606 or visit www.durangoarts.org. All classes begin at 10 a.m.
Saturday: Dancing through Broadway, Suzy DiSanto, instructor. Oct. 27: For the Love of Shakespeare, Mollie Fiddler, instructor. Nov. 3: Improvisation Games, Geoff Johnson, instructor. Nov. 10: Playwriting, Dinah Swan, instructor.